Includes all posted events for this affiliate, past and future. 1. Plyrs: The effective number of players, where a player taking part in all rounds of his/her section counts as 1.0, and any missed rounds reduce the weighting of that player. 2. TSI: Allows easy comparison of many different events, at a glance. The Tournament Significance Index (a.k.a. 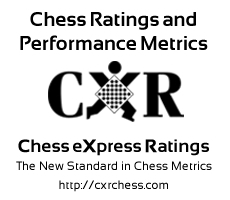 Tournament Strength Index) is an indication of the event's importance in the world of chess at large. A Significance Index is calculated separately for each Section ("SSI"), taking into account the number of players, their strength, the number of rounds, and the time control. The highest SSI in any tournament is called the TSI. Sections with fewer than 3 rounds or an effective** average rating below 400 or effective** number of players less than 4, do not qualify for an SSI. **Please look here for a complete explanation of TSI.